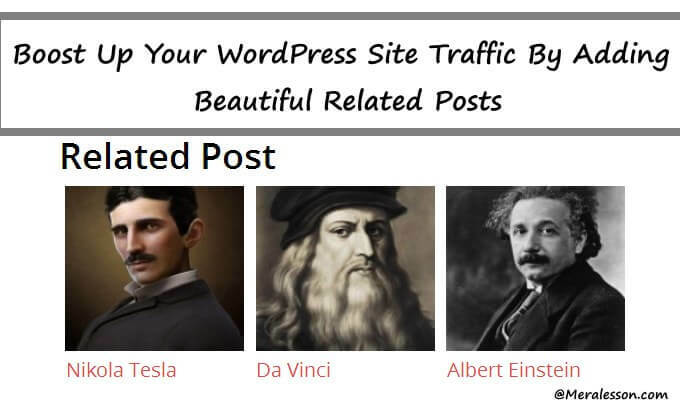 Like I said, There are many Related posts WordPress plugins that you can use to add related posts in your WordPress site. But the Yuzo - Related Posts plugin is one of the best plugin that helps you to display your related content in your WordPress. Which helps you to boost up your pageviews and engage your visitors. This plugin comes with many designs and features which makes your related widget looks amazing and also its fully customizable. The first thing that you need to do is download and activate the "Yuzo - Related Posts" plugin from your plugins tab. or you can upload manually. Still don't know how doing it, then read How to Install WordPress plugins. So once you have activated the plugin, then you need go to your settings tab and click on new option named " Yuzo - Related Posts ". And configure the plugin like if you want to limit the related post, then you can and if you want to show on your pages and categories then also can. And if you want to change the related poster designs or layout, then go to styling tab and select of the layout that suits you and then save the changes. Once you have done, then you able to see the related posts section in your WordPress posts or pages. Like this screenshot. So this is how you can add the beautiful related posts plugin in your WordPress site without any coding experience. We hope you may liked and learn from this article and if you do then like and follow us on Twitter, Facebook. And also give us your feedback on this tutorial or ask anything in the comment section below.